A survey of all Members of Parliament shows that the majority (73.5%) will vote Remain, while just 24.5% are voting to Leave. The survey showed that 9 MPs have not yet declared and that 7 do not intend on sharing how they are going to vote. Probably the biggest event of the referendum is taking place tonight in Wembley in front of a live audience of 6,000. The three for Remain are: Ruth Davidson, Sadiq Khan and Frances O’Grady. For Leave, it's: Boris Johnson, Gisela Stuart and Andrea Leadsom. The debate begins at 20:00 on BBC One. 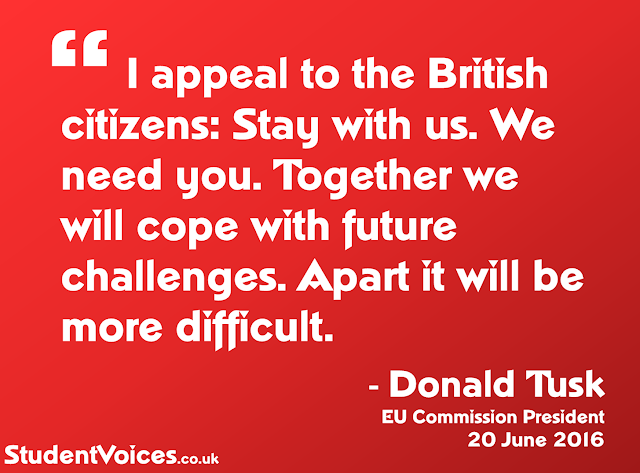 "We both hope the UK will remain a part of the EU. Nevertheless, whatever the result is going to be, we must take a long hard look on the future of the Union. We would be foolish to ignore such a warning signal as the UK referendum. I would like to appeal to British citizens on behalf of all Europeans: stay with us. We need you, without you the whole Western and transatlantic community will become weaker. Together we will be able to cope with the challenges of the future." Last week, bookmakers' odds suggested a 41% chance of leaving the EU. However, as in line with the polls, they've gone back to predicting a win for Remain by a fairly large margin. A recent poll by ComRes showed that more people would be 'delighted' if Leave wins than in the case of a remain vote. 44% said they would be delighted in the case of a Leave vote , compared to just 28% being delighted in the case of a Remain win. The poll also showed that fewer people would be disappointing in the case of a Leave vote. 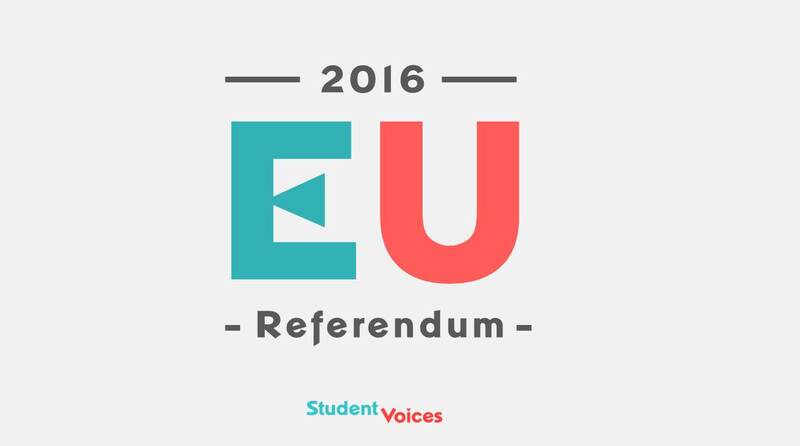 EU Referendum campaigning has resumed after both were suspended following the murder of Jo Cox MP. This morning Jeremy Corbyn and Michael Gove appeared on the BBC's Marr show to argue the case for remain and leave respectively. George Osborne also issued fresh warnings that leaving the EU would be a "one way door to a much more uncertain world". After a recent swing in the polls towards Leave, they seem to have leveled out again. The most recent Opinium poll put both Leave and Remain on 44%, while YouGov published two polls. One showed Leave ahead by 2 percentage points while the other showed Remain ahead by one point. Update: Campaigns will remain suspended until Sunday; all planned events for Saturday have been cancelled. Both the official Leave and Remain campaigns remain suspended following the death of MP Jo Cox. Events today have been suspended, including a speech by Nigel Farage, and an IMF review of the UK economy will now be published tomorrow. Neither campaign has said when campaigning will resume. 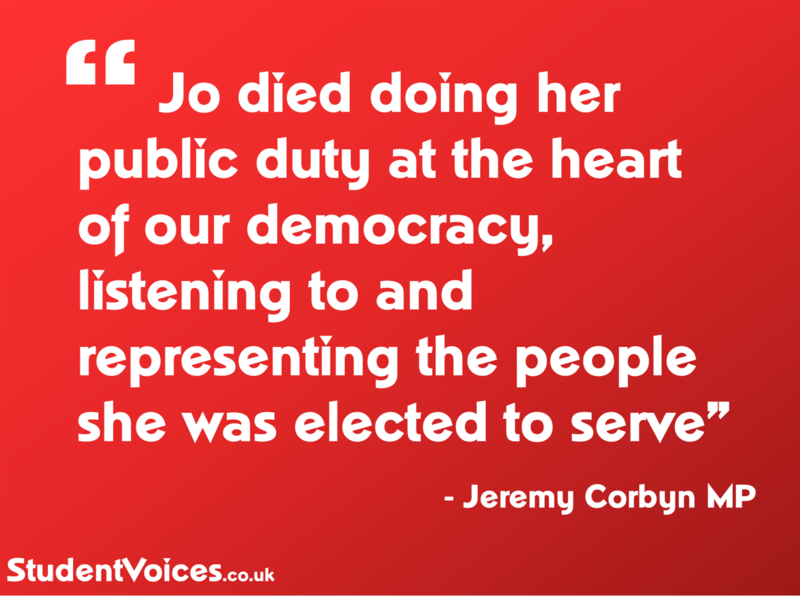 Vote Leave and Stronger In have suspended campaigning after Jo Cox MP was killed earlier today. George Osborne yesterday warned that, in the event of a Brexit, he would have to increase taxes and reduce public spending in an 'emergency Budget'. He warned this might include cutting the NHS budget and raising income tax; spending cuts of £15bn and tax rises to raise £15bn. 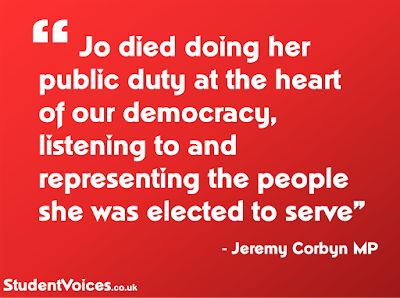 However, 57 Tory MPs have threatened to vote down an emergency budget and said in such an event, his position would be 'untenable''. 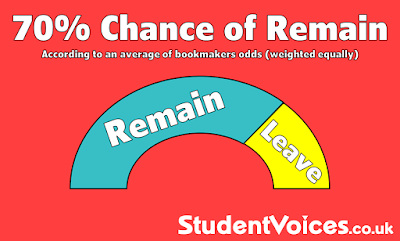 On the 25 May, bookmaker's odds suggested there was an 18.5% chance the UK voting to leave the EU. On 14 June that figure is 40.2%. 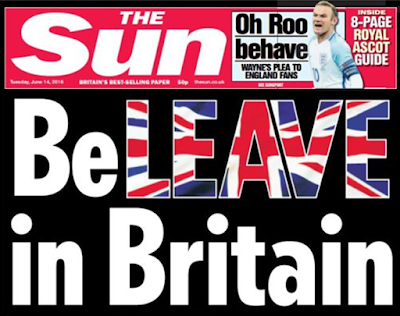 Having slashed their odds on Brexit, the likelihood of us leaving is, seemingly, greater than ever before. In fact, William Hill's spokesman said: "the momentum is such that it seems inevitable Brexit will be favourite by the weekend if this trend continues". Every major poll released on 13 June put Leave ahead by large margins. A YouGov online poll put leave on 46% and Remain on 39%. An ICM online poll put Leave on 49% and Remain on 44%. An ICM phone poll Leave on 50% and Remain on 45%. It seems to be closer than ever before and more uncertain than ever. But something that hasn't changed is the way 18 - 25 year olds intend to vote. 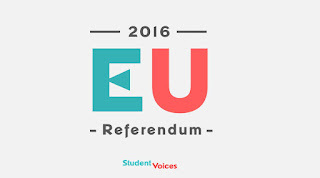 The YouGov poll that put Leave seven points ahead said that 18 - 25 year olds are 60% Remain and 20% Leave. The 'youth' vote is very much in favour of Remain.